Do you know what's wrong in this picture? "I have owned, trained and bred dogs for 45 years. I have trained protection dogs and police service dogs since 1974." "One of the more common reasons a dog becomes dog aggressive is because that dog has been attacked by another dog. Pet owners need to understand that once their dog has been attacked or even badly scared by another dog thier pet dog will be dog aggressive its entire life. This only needs to happen one time to become a life long problem. [[ SIDE NOTE: Suzanne (My Little Dog Training Owner) took her 3 year old Service Dog (Wyatt) out one day, and a "fake" service dog (purchased a service dog vest online and put it on their inadequently trained pet) that attacked Suzanne's Service Dog. Subsequently, Wyatt never recovered and was retired. This is a great emotional and financial loss (agency trained Service Dogs range from $35,000 to $50,000). I compare this to anyone who has ever been robbed, mugged or had their personal safety[/space] violated. This has a life long effect on how that person perceives the world. They should never allow their puppies [or dogs] to be around strange dogs. To do so is the same as playing Russian roulette with their dogs mental stability. 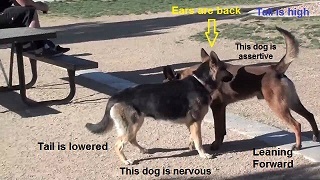 If their puppy [or dog] is attacked, they will then own a dog aggressive dog. The same goes with pet owners who take their dogs to dog parks. There is no way knowing if one of the dogs in that park has dominance or aggression issues. Here is more information about Dog Parks. This file requires Adobe Acrobat Reader, a free program for reading PDFs Download Here.